By Kori ~ June 14th, 2012. Would you like a quick suggestion for a good wine to drink tonight (or this weekend) that wonâ€™t break your budget and is widely available? Many of our readers have said this is something they would like, so here is this weekâ€™s selection, the 2010 The Seeker Sauvignon Blanc from the Marlborough region of New Zealand. The Seeker is a global wine brand featuring quality wines produced by family-owned wineries around the globe, each committed to sustainable farming and environmentally friendly methods of production. Each Seeker wine is bottled in lightweight glass, recycled and recyclable, and uses locally sourced packaging materials. Steve Smith, MW, sourced the grapes for this 2010 Seeker Sauvignon Blanc from two of New Zealand’s best Sauvignon Blanc growing regions, Marlborough and Martinborough. 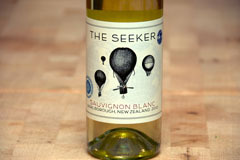 2010 The Seeker Sauvignon Blanc (Marlborough, New Zealand): Pale, greenish straw yellow. Very aromatic with grass and lime on both the nose and palate. Dry and medium-bodied with tart acidity and a long, refreshing finish. A nice summer sipper.